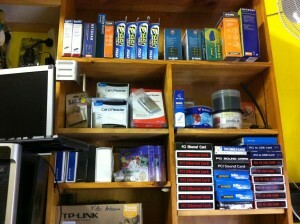 We keep in stock a modest range of the most often needed spare and computer parts. Although we don’t keep new laptops or more expensive computer parts on hand we can place an order and take delivery the next business day. We can keep our prices reasonable because we don’t need a warehouse of parts and we keep overheads to a minimum. If you’d like to check on availability of parts or get a quote please contact us.